of this months's data acquisition news. follow us on Twitter - @DataAcquisition. Video Turnstile outdoor people counting system. over 98% accurate, even in the busiest situations. in real-time as they happen. meet your accuracy needs in your specific conditions? systems can exceed 98% accuracy. accuracy tends to decrease with wide or busy entrances. bring accuracy down to 80%. being replaced by automatic counting systems. more expensive beam counters are directional. you full access to all data so you can analyse it as you wish. count per week, per day, per hour, per half-hour, in real-time? If you want to see your own data - in what format do you it? counters can be installed by businesses themselves. column is the number of people. 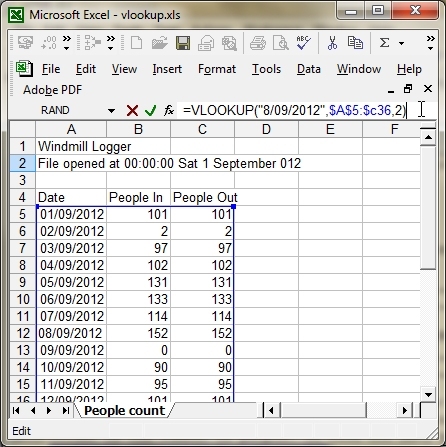 - in our case 2.
just select text as the format of the date column. Building control technologies and seminars. production technology supporting vehicle design. find them, apprehend them and give them a prize. to be rolled out across the globe.